Fly Sense is the only combination vape detection sensor and alert system which also includes the ability to monitor and detect sound anomalies that could indicate fighting or bullying is occurring. Fly Sense is the only combination vape detection sensor and alert system which also includes the ability to monitor and detect sound anomalies that could indicate fighting or bullying is occurring. When vaping or elevated sound is detected, school officials are notified by text message, email or through the mobile app. Fly Sense was developed in response to the growing health hazard of student vaping in schools. Vaping is a recognized national health epidemic with a 900-percent increase in e-cigarette use among high school students over the past 4 years. In 2017, it was estimated that 2.1 million youths were using e-cigarettes. In terms of bullying, over one-in-three students or 3.2 million each year are bullied in American schools. Bullying has been linked to suicide, the leading cause of death among young people. Fly Sense 2.5’s innovative technology to detect and deter vaping and incidents, such as bullying and fighting in schools, has attracted major TV and national media attention. Municipalities that need to enforce anti-vaping laws as well as private sector companies seeking to prevent vaping in the workplace have purchased Fly Sense. “Over the past year we have listened to school administrators, parents, teachers, government leaders and members of the business community about the vaping problem. They all recognize that vaping, using Juul devices and other e-cigarettes which use liquids that contain many toxins and nicotine, are a significant health risk for young people. Addressing the vaping epidemic requires a multi-pronged initiative. We must use both technology-based and education-based tools. On the technology side, Fly Sense 2.5, includes new and more powerful sensors as well as features which users have been asking for,” said Derek Peterson, CEO Soter Technologies. 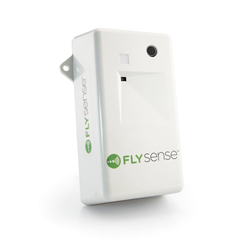 Schools in 21 states and Canada have purchased Fly Sense sensors and alert systems and wide-scale adoption of the technology is expected. Many states, including New York State, have made it illegal to vape on school grounds. Fly Sense is a cloud-based platform with hard-wired sensors that detect and send alerts to school or workplace officials when vaping or other potentially harmful incidents are taking place in bathrooms or other isolated areas such as locker rooms. When the sensor detects decibel level anomalies typically associated with bullying or chemicals from vaping, it sends an immediate notification to designated officials’ computers or mobile devices. Hauppauge based Soter Technologies provides the extra sense to stay aware of threats. Using advanced sensor and software technology, Soter Technologies develops and delivers innovative solutions for environmental intelligence – to make the world a safer place, from schools to enterprises to public spaces. Taking a holistic approach to safety and security, Soter provides technology tools to detect and deter without invading privacy. Soter Technologies was founded as Digital Fly™ in 2015 – focused on social media awareness for safer schools and communities – and gained notoriety in 2017-18 for its unique FlySense™ Vaping & Elevated Sound Detector. The Soter name is inspired by Greek mythology wherein Soter is the personification of safety, deliverance, and preservation from harm. http://www.sotertechnologies.com.